Coproduced with the Musée National des Beaux-Arts du Quebec. This fully illustrated book contains essays by Gwendolyn Owens and Saul Ostrow; and an interview between Yasmeen Siddiqui and Melvin Charney. Melvin Charney has worked extensively on the frontier of art and architecture, making photographs, sculptures, installations, constructions, and gardens that take the city itself as a measure of our urban condition. A keen observer of the built world we inhabit, his work is informed by a comprehensive knowledge of architecture—its theory, history, and current practice—as well as his overall understanding of cities themselves. Through his art, he plays the role of both observer and intervener. Among Charney’s most compelling works are his painted photographs, the subject of this book and of an accompanying exhibition held at Americas Society in spring 2008. 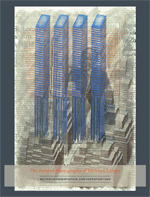 In his series PARABLES, IN FLIGHT, THE AMERICAN CITY, CITIES ON THE RUN, ONE FIT SIZES ALL, and BODYWORKS, Charney uses a single image as a starting point: a found photograph, a front-page picture of a building, or, more recently, seedier images culled from the back sections of newspapers and magazines. Set free from their original contexts and introduced afresh into Charney’s work, these buildings take on an entirely different life. Through this unique artistic process, Melvin Charney makes us more aware of the triumphs, tragedies, and absurdities of the modern city, and compels us to see the city and its buildings in a completely new way.